“Over the hill and through the woods to Grandmother’s house we go….” But can you get back home? TOPS Knives is introducing their Survival Neck Wallet. The “SNW” is a convenient collection of the most needed survival tools packaged in a high quality Ballistic Nylon neck pouch. If you’re heading off to Granny’s for the weekend or to the mountains of Afghanistan, carry the tools you need to make it back alive. 1. TOPS own Survival Whistle independently tested at 126 decibels. 4. The TOPS Firestarter with Ferrocium Rod and magnesium. 5. Traditional P 38 military can opener/Firestarter striker. 11. 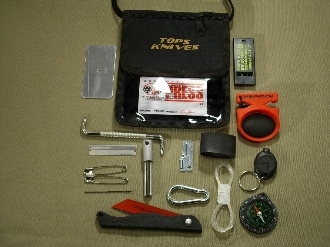 Snap Link 3/16 " x 2.0 "
The Team at TOPS KNIVES., along with the crew attending the “PWYP” Survival Outing compiled the above essentials. Then they designed the Survival Neck Wallet with enough space to allow you to add additional items to customize the kit for your needs. If you have a Traveler, Hiker, Biker, SAR, Soldier or Lawman on your Christmas list, this may be the most sensible and useable Christmas gift you can think of, and will be downright useful for years to come.